Author Suzanne Webster LowriePosted on October 13, 2014 October 12, 2014 Categories Giveaways, Product Review, PromotionTags craft storage, giveaway, Giveaways, promotion, ribbon, ribbon storage, storage14 Comments on Ribbon Organizer Review by Suzanne, and Show Us ***Your*** Happy Place-Week 2! Hello, it’s Suzanne here today with a tip for storing small pieces of ribbon (or twine, string, floss, etc.). We all have a favorite brand, color, or pattern of ribbon that seems to run out sooner than the rest. If you keep your ribbons on their original spools, that means that you may be taking up prime storage real estate with a tiny piece of ribbon left on a large spool. The solution that works for me, is to take the remaining ribbon off its spool and twist it around a tongue depressor (also called a jumbo craft stick or popsicle stick). Have a look at the pictures below to see how crafters are using this technique. This first picture is from my own small ribbon storage. I wrapped ribbon, waxy flax, twine, and hemp string around tongue depressors and then corralled similar ribbon types in Mason jars. Here is a picture of the same technique but the ribbon is stored in clear jars. There are plenty of pictures on this site, so check them out for some great ideas. This ingenious way to organize and store small pieces of ribbon utilizes clothespins. I love this idea because the ribbon can be held in place by the clothespin clasp, which prevents unraveling. These ribbon pieces are wrapped around a completely different type of clothespin. The advantage of this wooden pin is that it is round, and will not kink the ribbon during storage. And finally, we are back to the tongue depressors, but with a twist! These wooden sticks had holes punched in one end so that a steel jump ring could be placed through them and clipped together. There is a step-by-step tutorial at her website if you are interested in this type of storage. Be sure to check out all of the links for additional pictures on each storage solution. 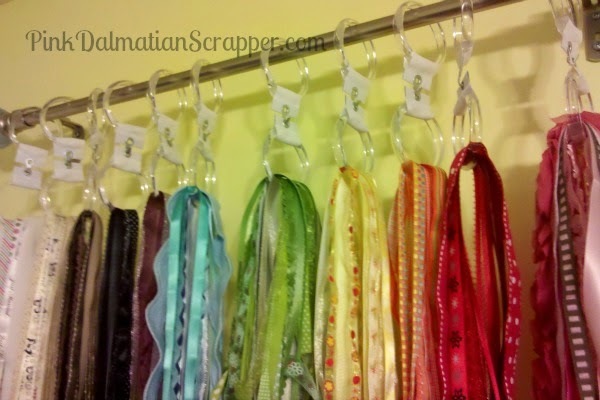 Do you have a favorite way of storing small pieces of ribbon? Be sure to share with us in the comments below! Happy Monday. It’s Cicily sharing a quick tip for you today. Back when my scrapbook supply collection hadn’t overtaken my room and I wasn’t so concerned with organization, my sister had me flabbergasted when she coordinated her cardstock by color. I thought she was a little off her rocker. Then she sorted her buttons by color. I still wasn’t fully convinced. But then I started thinking about how easy things are to find if you were able to go straight for the right color. Then this happened in my room! My buttons, card stock and scrap paper soon followed suit and were sorted by color . I have to admit it helps a lot when searching for a specific color of something. I even sorted my patterned paper by color, right next to my card stock. I don’t do this with everything, mostly with supplies that I don’t have too many of, like my washi tape and markers. Organizing is all about what work’s for you. If you haven’t tried color sorting, give it a whirl! Hello! Do you have a favorite pattern or design? Mine is polka dots. I love the thought of them, the sight of them and even the words…polka dots! They make me happy. So when I discovered The Polka Dot Closet on Pinterest, I was intrigued. Why didn’t I think of that name! I’ll be sharing just a snippet of this pretty craft room in the photos below. Be sure to stop by for a visit with Carol to see how her craft space was redone and all of the shabby chic storage ideas she has to share. Carol utilized the space above her window to display these pretty linen covered storage boxes from Ikea as well as a handy ribbon rack. As you can see in this close up, her shelf and ribbon storage are made from wire closet supplies. Sturdy without bulk! Isn’t her fabric closet neat and tidy! Shelving provides plenty of storage for her fabric. The bins in the lower portion of the closet are also from Ikea. Take a look at Carol’s luscious chocolate brown computer area! She made a bulletin board that matches her stool from foam core. And finally a full view of the sewing table. It’s accompanied by the prettiest little stool topped off with the sweetest polka dot fabric.! Sigh, isn’t it dreamy. I’m so happy you could spend a little time with us today. Stop by to tell Carol hello, you’ll enjoy your visit at The Polka Dot Closet.